Cost: $5 for Adults, $3 for Students and Seniors, Free for Children under 3, Free for Everyone Thursday from 12:00-4:00pm. Our Review: The John C. Freeman Weather Museum is located on Caroline in the Museum District. It’s located in the heart of the district, but on a side street that is not as heavily traveled as some. The new Asia Society is across the street. 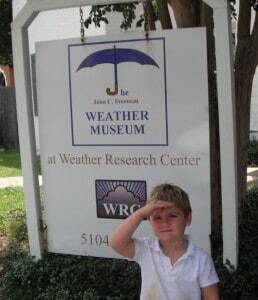 The Weather Research Center was founded in 1987 to educate the public about weather and weather safety. The Weather Museum opened in 2006 and was the nations first weather museum. To learn more, go HERE. On Thursday afternoons, noon to 4:00pm, the museum is open for free to the public. My kids and I went on a Thursday afternoon during the summer. Metered street parking was available but we parked, for free, in the Asia Society lot across the street. Inside the museum of busy, but not crazy like other museums on the free admission days during the summer. The staff at the museum was very friendly and invited us to look around. Much of the museum is dedicated to hurricanes, which is very appropriate for Houston. I liked looking through the Hurricane preparedness section and Joe liked the Hurricane video. We now know about storm surges and the Texas Coast. Joe also liked making his own tornado. 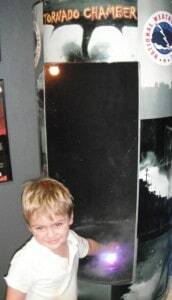 He was able to touch the water vapor as the vortex formed and a tornado was created in the simulator. A very popular room was the weather forecast center. A big group was reporting their pretend forecast (and taking home DVDs for $10). It was so busy that we skipped it with a promise that we would visit the similar display at the Houston Museum of Natural Science. We spent about an hour touring the museum. 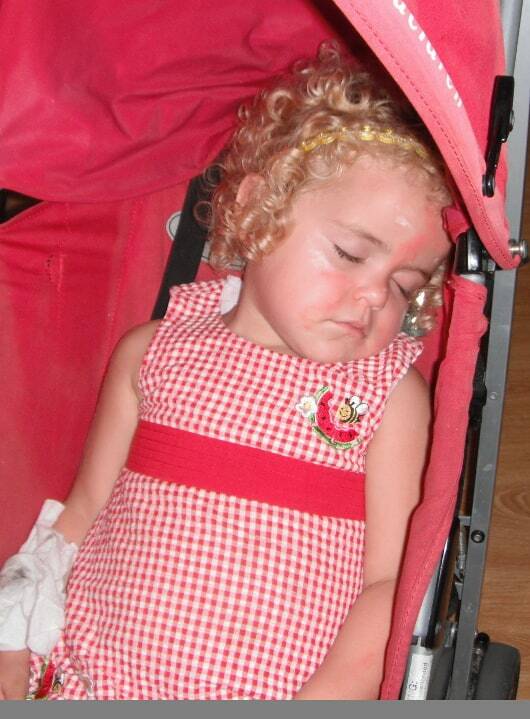 Brooke slept through it all, so we’ll be sure to go back. We encourage you to go check it out as well. Why not learn about weather and enjoy the air conditioning, for free, on Thursdays? Where in Houston? The Houston Fire Museum!